The cathedral organises visits every day. They last approximately one hour and present this site’s Christian message by examining the cathedral as a work of art and the artwork it houses (architecture, sculptures, paintings, stained glass, history). Notre-Dame de Paris is a medieval catholic cathedral, widely considered to be one of the finest examples of French Gothic architecture. The innovative use of the rib vault and flying buttress, the enormous and colorful rose windows, and the naturalism and abundance of its sculptural decoration all set it apart from earlier Romanesque architecture. The cathedral of Notre-Dame de Paris is one of the jewels of Paris and one of Europe's masterpieces of Gothic architecture. 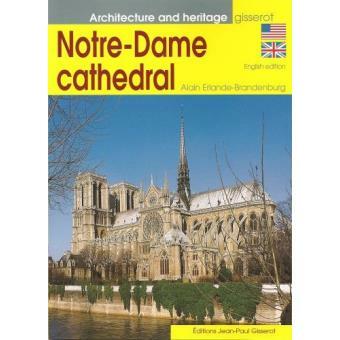 This guide on the cathedral aims to evoke the awe-inspiring monument that attracts countless visitors around the world. Three extraordinary characters caught in a web of fatal obsession are at the centre of Hugo's novel. The grotesque hunchback Quasimodo, bell-ringer of Notre-Dame, owes his life to the austere archdeacon, Claude Frollo, who in turn is bound by a hopeless passion to the gypsy dancer Esmeralda. She, meanwhile, is bewitched by a handsome, empty-headed officer, but by an unthinking act of kindness wins Quasimodo's selfless devotion. Behind the central figures moves a pageant of picturesque characters, ranging from the cruel, superstitious king, Louis XI, to the underworld of beggars and petty criminals. These disreputable truands' night-time assault on the cathedral is one of the most spectacular set-pieces of Romantic literature. Hugo vividly depicts medieval Paris, where all life is dominated by the massive cathedral. His passionate enthusiasm for Gothic architecture is set within the context of an epic view of mankind's history, to which he attaches even more importance than to the novel's compelling story. Alban Krailsheimer's new translation is a fresh approach to this monumental classic by France's most celebrated Romantic. Nos Ancetres les Gaulois is a Parisian Institution offering a unique formula, both qualitative and quantitative, where employees and its guests contribute to the conviviality in a medieval, authentic and festive atmosphere, leading to a unique and unforgettable experience. Nos Ancetres les Gaulois - The only one in the world!